This illuminated relaxation fountain includes a Classic yet Modern Design, bringing serenity to any home by creating a stress free ambience. The authentic and elegant finish illuminates softly for a luxurious effect. Free flowing water streams over natural granite creating a subtle presence with the soothing sounds of water. This Elegant Relaxation Fountain is ideal for indoor or outoor use and Includes; Authentic Granite Ball, natural stones, resin base, low voltage LED Lights and Ajustable fountain pump. The contemporary design of the Tallulah fountain can be viewed from anywhere in a 360 degree setting. Smooth, clean lines and the soothing sound of flowing water make it a great addition to any space. Easy to setup, comes complete with everything you need, including a powerful energy efficient pump and LED accent lighting for evening ambience. Made from 4th generation NuCrete, a fibre reinforced concrete material that provides the strength, appearance and durability of traditional concrete products, without the weight. The Huron Falls fountain's realistic natural creek-like appearance is further replicated with its soothing water movement and sound. Invoke a sense of relaxation and add the soothing sound of flowing water to any surroundings with ease. Easy to setup, comes complete with everything you need, including a powerful energy efficient pump and LED accent lighting for evening ambience. Made from Comp-Cast<sup></sup>, a resilient stone, fibre and resin material that provides strength, without excessive cumbersome weight. Create a soothing and relaxing space with this beautiful water fountain. The fountains gently flowing water provides a calming effect as it soothes nerves and restores body, mind and spirit. Ideal for indoor use, the fountain will add a decorative touch to any home or office dicor. Ideal as a gift for any occasion. Illuminated Relaxation Fountain with Granite Pillar and Natural Stones This illuminated relaxation fountain includes a Classic yet Modern Design, bringing serenity to any home by creating a stress free ambience. The authentic and elegant finish illuminates softly for a luxurious effect. Free flowing water streams over natural granite creating a subtle presence with the soothing sounds of water. 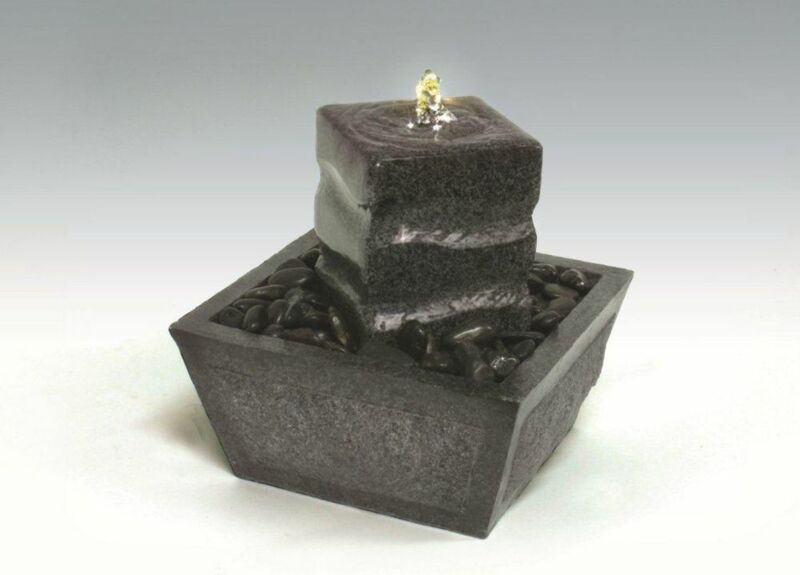 This Elegant Relaxation Fountain is ideal for indoor or outoor use and Includes; Authentic Granite Ball, natural stones, resin base, low voltage LED Lights and Ajustable fountain pump.